Lots of people get themselves into minor trouble on Mount Timpanogos, but most of them limp out and their stories aren’t told publicly. When people get into trouble, it’s often because they weren’t prepared for anything other than ideal conditions. Timp frequently declines to serve up ideal conditions. The best way to stay out of trouble on the mountain is to not assume it will be an easy day hike, but instead to realize it will be a difficult hike, so you should think about what might go wrong, and prepare for it physically, mentally, and materially. Then, as you hike, continue to think about what’s going on, and adapt appropriately to the hazards that present themselves. Far too many people go up the mountain utterly oblivious to the danger they are getting themselves into. There are stupifying levels of cluelessness on the mountain, matched only by a fortuitous amount of dumb luck. Some people cannot even figure out which way to descend because they can’t recognize the trail they came up, and can’t be helped because they do not know the name of the trailhead they left from. Our species would not have progressed much if we only did things we knew how to do, so some bold adventuring is good. However, it remains true that natural selection still functions on Timp, and the mountain can take a toll on more than one’s feet and knees. Be prepared! Timp has been climbed safely over a thousand times by a local retired man, and tens of thousands of other people have summited it, some without incident. Be one of the people who come back with happy stories, not stories of near misses. Proper preparation includes being in good physical and mental shape; wearing sturdy and comfortable footwear; putting on sun protection; carrying clothing suitable for bad and cold weather even if the morning breaks clear; having a paper map, and knowing how to read it; having a first aid kit, with material for dealing with blisters, cuts and scrapes from falls, and sprains, and knowing how to use it; bringing illumination in case you don’t get down before dark; carrying a lunch and snacks for an entire day on the trail, because it takes a full day for most people to go up and back; and definitely hauling lots of water, or some water and water purification equipment for getting more water from streams. Note that during late summer there may be no streams running anywhere along the upper miles of trail, although there will be water in Emerald Lake. Kleenex, a litter bag, and possibly bug spray might be handy; think through what else you might need. You should also probably let someone know where you’re going, and what they should do if you don’t report back. There are many hazards on the mountain, and they are constantly changing. It is up to you to figure out how to recognize and deal with whatever problems come up during your hike. Pay attention to your surroundings so you will know where you are and where you have come from. Don’t go where the terrain is dangerous, just because you think you’re on an official trail and want to assume it must be safe despite appearances to the contrary. Mind where you step, both to avoid tripping, and to avoid stepping into thin air in places where the trail is eroding away. Don’t cross a snowfield near a waterfall or over a stream, because of the danger of killer snow holes; in fact, be wary of snowfields generally (see “When to Hike” below). Prevent debilitating problems like blisters or dehydration or hypothermia, by wearing the right footwear and clothing, and carrying the right equipment. If you run into stinging nettle, or lightning, or an ornery moose or stubborn mountain goat, or rockfall, work out how to deal with it. Figure it out quickly if it’s a charging moose or falling rock. If it becomes dangerous to continue, turn around. Sliding down the glacier is an outstanding way to get injured, no matter how many people tell you they’ve done it safely. You can choose to slide it, just don’t complain if you hurt yourself. It’s a long way off the mountain when you’re trying to hobble down with injuries. Many of the injuries on Timp happen because of unwise behavior. Behaving foolishly in the wilderness is not a good idea; there is no safety net in the backcountry. Use common sense (which is usually futile advice, since those without common sense routinely confuse certainty with competence). All of this is especially important because rescue is not likely to be immediately available. Even if your batteries hold up, there isn’t cell service on many parts of the mountain, especially along the Timpooneke trail, although you shouldn’t need to call for help because you should usually get yourself out of the situations you get yourself into. It may be instructive to learn how people die on Mt. Timp. Here is a summary of most of the deaths in the past one hundred years; scroll down for additional details in a section below: eleven died from falls, five died from dropping through collapsing snow bridges into holes or from sliding into crevasses, five died from avalanches, four died from snowstorm-induced hypothermia or from late autumn cold, one died from rockfall, two died from heart attacks, one died from a bear attack, two died from a ski lift accident, two were murdered, one was a suicide, one cause of death was unknown, and six died from airplane crashes. One thing we learn from these incidents is that it is never good to fly a bomber into the side of the mountain. Other things we learn are to properly outfit yourself for your adventure, and to pay attention to what’s going on around you. If you fail to adapt to conditions, ye need not abandon all hope. In 1983, in conjuction with the Utah County Sheriff and the U.S. Forest Service, volunteers formed the Timpanogos Emergency Response Team, and on most weekends during the midsummer to early fall there will be a high camp team camping near Hidden Lakes and spending Saturdays at Emerald Lake with first aid and other emergency supplies, communications equipment, and advice (beginning in 2017, TERT also began stationing someone at Stewart Falls (Stewart Cascades) on summer Saturdays). 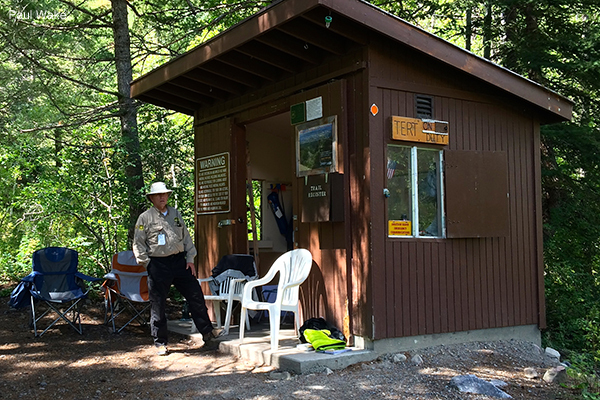 TERT radio operators at the trailhead shacks both keep in touch with high camp and dispatch, and provide advice to hikers; they camp at the TERT sites in the nearby campgrounds. You are responsible for your own safety while on Timp, but TERT does try to be available to give free help when the mountain gets its heaviest use, and that can cut hours off the time it would otherwise take to get assistance. Don’t hesitate to ask them for help with small things, like blisters or water or directions or wrapping an ankle, because TERT’s whole point is to keep small things small. If Fortune’s wheel does not keep things small, and you are too injured to walk out, the Utah County Sheriff Search and Rescue team can hike up Timp and evacuate you. On the plus side, SAR has a wheeled litter and will carry people down the mountain for free (although if you need an ambulance to the hospital, that will cost you). On the down side, you’re going to hurt for a long time while waiting for SAR to arrive, and while being evacuated. Which brings us to medical helicopters. 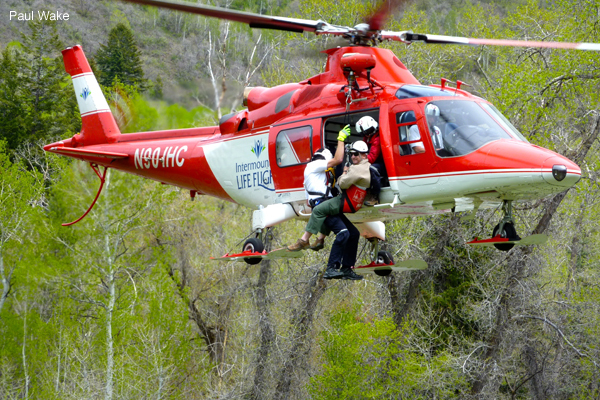 For life threatening conditions, helicopters can legally enter the wilderness, although weather and landing zone availability need to be decent. No one will fly in to give you a ride just because you overextended yourself, though. All in all, it’s best to consciously avoid serious hazards. 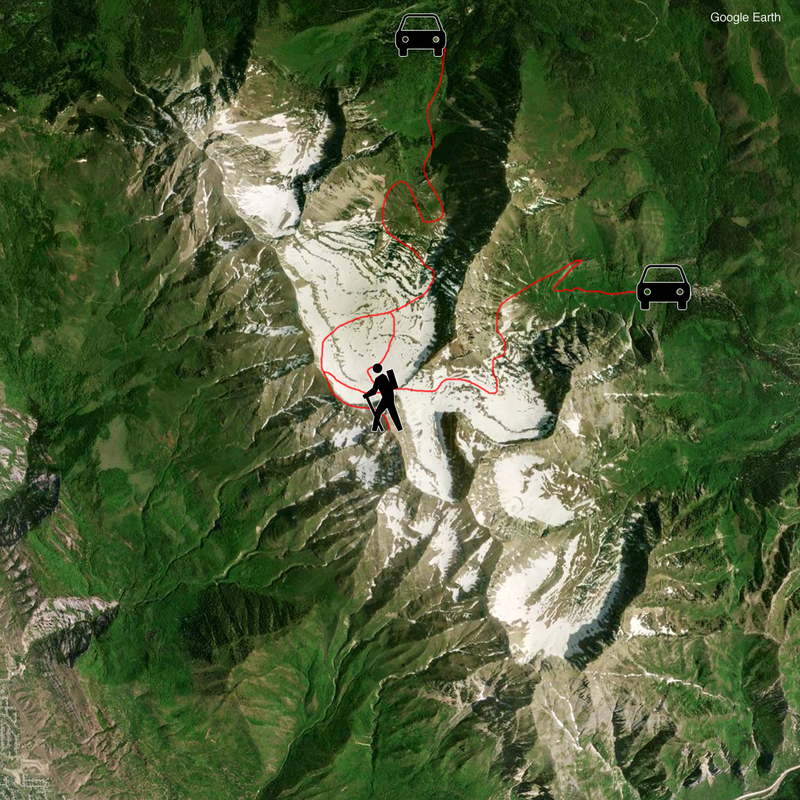 Should You Do this Hike at All? 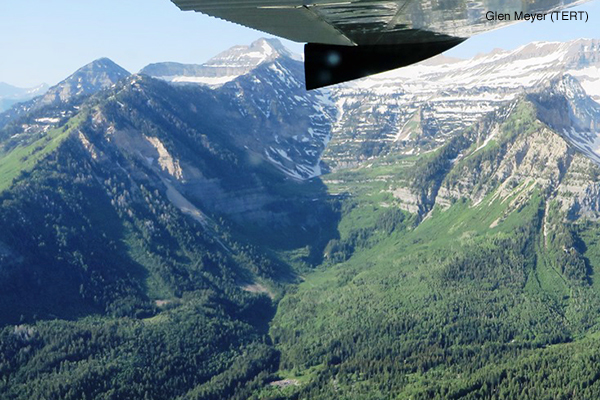 Much of Mount Timpanogos is a beautiful wilderness area. 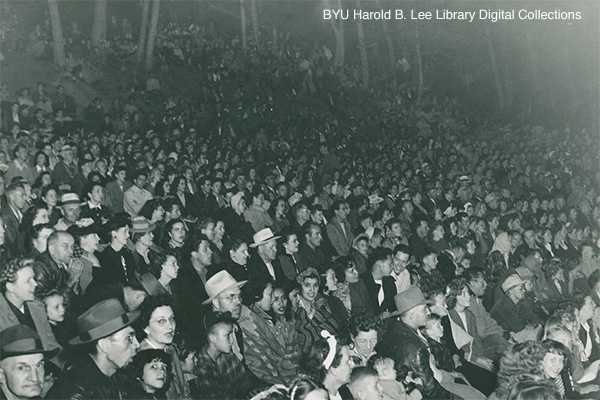 It does not have unlimited resilience, however, which is one reason why the annual Timp Hike was discontinued—thousands of people hiking at one time was hurting parts of the mountain (another reason was BYU’s concern over drinking and “hoodlumism” in camp). The U.S. Forest Service now limits group sizes on the trails to the summit, to a maximum of fifteen people per group. Even so, tens of thousands of people a year head up the two summit trails. The Forest Service also prohibits campfires within the wilderness, so backpackers need to take stoves instead of building fire pits and tearing down trees. The general rule is: leave no trace. More specifically, don’t litter. Don’t cut across switchbacks—stay on the trail, instead of carving erosion gullies into the mountain. Don’t do anything else that could be on this list of obvious no no’s, like rolling rocks or letting your dog chase baby mountain goats. Scoutmasters and parents, please go over this with your kids before setting out. There is a sad truth about the stay-on-the-trail rule: the trails have so many spots that have worn away to nothing due to no maintenance, and so many areas that get overgrown each year, that people have beat in many side trails and it can be hard to even identify the proper trail. Just do your best to follow the original trail, skipping shortcuts as much as possible. If you want to adopt a higher ethic, then leave the mountain better than you found it—pack out other people’s trash, scatter fire rings, and help maintain what few barriers there are blocking shortcuts across switchbacks. Let’s recap this one more time: please don’t litter, and please stay on the trail instead of cutting across switchbacks. It’s hard to overemphasize how important it is to leave no trace. Part of the mountainside near Stewart Falls (Stewart Cascades) has been entirely denuded of vegetation, as has part of the area just below Emerald Lake, and those places are now nothing but eroding dirt slopes. Don’t turn more of the mountain into that kind of mess! There are no toilet facilities past the trailheads. There used to be a toilet in an outhouse off to the side of the Timpooneke trail by where the trail crests into the Timpanogos Basin, complete with a trail sign showing the side path, but the outhouse is completely dilapidated and the toilet is full and foul; ignore the sign and the trail guides that tell you it’s still an option. There is a lesser known open air toilet above Emerald Lake, but it is slowly collapsing in on itself, and it probably would not be enjoyable to be the person to have that plywood finally give way underneath you. Toilet facilities at Timpanogos Shelter have been gone for decades, and the Forest Service no longer flies toilets in to Hidden Lakes. It does not appear to have occurred to the Forest Service that concentrating impact at a couple of well made toilets might be better for the mountain than the current situation. The Forest Service likes to pretend that by declaring the summit trails part of a wilderness area, they magically become wilderness, but the fact is that Timp is different from any other wilderness area in Utah—the mountain literally abuts the city limits of the towns that most people in Utah County live in, culturally the summit trails are essentially a rugged urban park that is more popular than the parks in the valley, and so at times there may be over two thousand people on the trails at once. It is past time to see the exception to the rule, and return decent toilet facilities to the upper mountain. For now, though, defecate before starting out, avoid urinating near streams, and if you are a backpacker staying on the mountain for awhile and you have to do some business, bury your feces and pack out your toilet paper, or pack it all out. 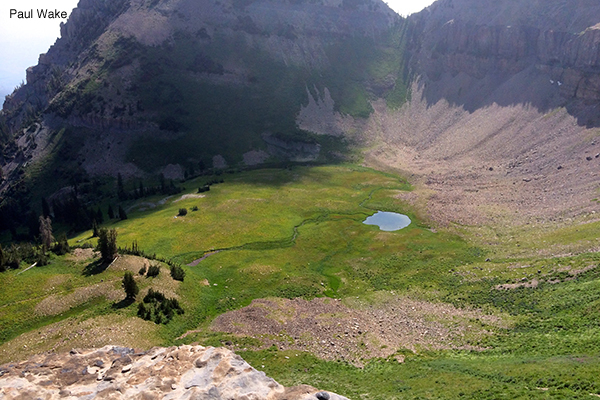 Be aware that above Hidden Lakes or the north edge of Timpanogos Basin there aren’t many trees providing privacy, and everything above 10,600 feet is above tree line. The Forest Service sometimes has a backcountry ranger patrol Timp to encourage good behavior, although the ranger labors under the handicap of not being authorized to shoot people who litter, cut across switchbacks, start fires, or let their dogs off leash. Hike in the mid to late summer or early fall, depending on conditions. Unless you are a mountaineer, adept with an ice axe, it is best to wait until after the snow has cleared from the trails before attempting to hike up Timp. It is dangerous to cross the steep snowfields that can linger into midsummer, because you can slip and then slide rapidly to the rocks below, because you can fall into a moat where the snow melts away from the rock at the edges of the snowfield, and because certain snowfields with runoff flowing beneath them essentially melt from the bottom up, and when they get thin they can break under your weight and drop you a surprising distance into cold snow melt, an experience that tends to be fatal. Snowfields near waterfalls can form into killer snow holes that are particularly dangerous. A rule of thumb is that if you can still see any snow at all on the mountain from the Utah Valley side of Timp, it is too early for most people to safely climb the other, snowier side of the mountain where the summit trails are. 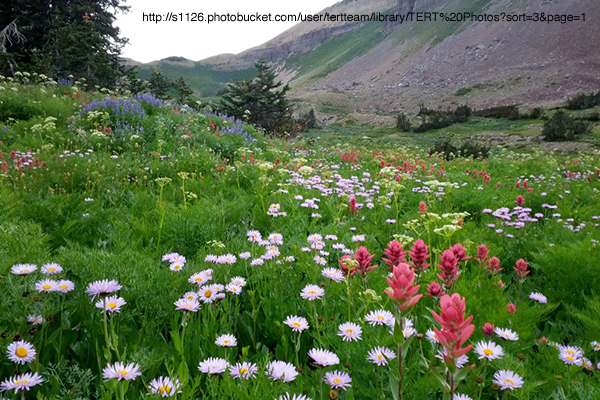 One of the best times to hike is when the wildflowers are out, which is late July or early August, depending on conditions. The wildflowers in the upper basins, particularly the Timpanogos Basin, are incredible. This is when summer afternoon thunderstorms pop up, though. The early fall, before it snows, is also quite pretty. Be aware that hunting season is in the fall, and—although the webmaster certainly doesn’t oppose hunting for food—there is a subset of hunters so clueless that they think it appropriate to ignore the rest of the outdoors and hunt on Timp along some of Utah’s busiest trails (in 2016 a couple of them rode up to Emerald Lake on a Saturday when hundreds of hikers were on the upper mountain, and dozens of mountain goats were milling about near the lake, and shot themselves a goat in a display of manliness that seemed not to do much for public support of safe hunting). Keep in mind that it can snow on the mountain in any month of the year including in August. Some people like to do night time hikes to be on the summit at dawn. Be aware that it isn’t always easy to find your way up the trail at night unless you not only have a good light with fresh batteries, but are already familiar with the route. The upper Primrose Cirque switchbacks in particular have a number of false trails that are confusing even in daylight, and there are many spots on both trails where the trail has eroded away and is turning into drop offs. Make good use of your light. It often seems to be a revelation to the local college crowd that a dark, windy, high altitude summit isn’t very warm in just shorts and a cotton t-shirt. Keep in mind that if you’re bellowing songs as you make a midnight climb, every backpacker in every tent on the mountain can hear you. A handful of people climb Timp in the winter. This is a completely different adventure than day hiking, as it constitutes serious winter mountaineering. For non-alpinists, there are places to snowshoe or cross-country ski on and around the mountain. The Aspen Grove (Mount Timpanogos) trailhead is open all winter, but those thinking of a short excursion up that drainage should keep in mind that avalanches come down into the upper basins and the lower drainage every year (this one at Aspen Grove being an example). This mountain almost delights in massive natural releases. If you’re cross-country skiing or snowshoeing westward from the trailhead then you’ll want to go a ways toward First Falls to get away from the snow machines on the road, but do not go too far unless you know what you are doing. If you and your friends aren’t carrying avalanche beacons, probes, and shovels, you probably don’t know what you are doing. The same warning applies to backcountry winter travel elsewhere on the mountain, including skiing in from Bear Canyon or the Pine Hollow trailhead and from points east of the Baldy saddle. 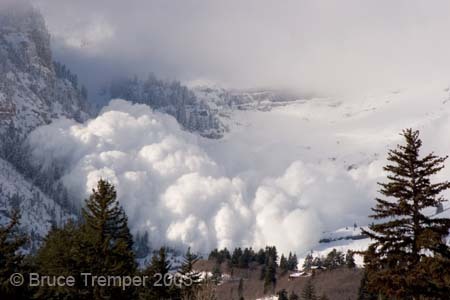 Take this seriously—in the past quarter century the most common cause of fatalities on Timp has been avalanches. Skinning up Timpanogos is fun, but no other mountain in Utah has buried recreationalists so deeply for so many months. 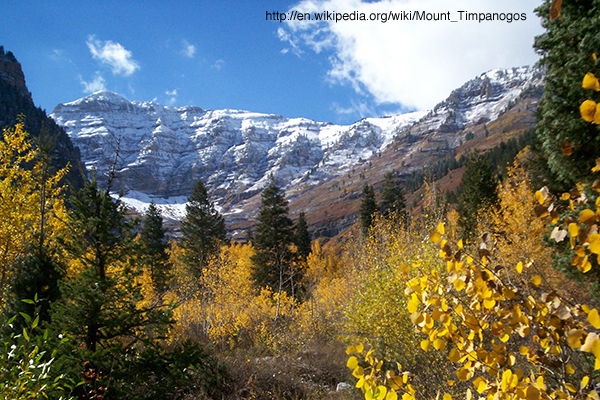 There are two main ways to hike Timp, the Aspen Grove (Mount Timpanogos) trail, and the Timpooneke trail. Both trails have their virtues, and if you can arrange a shuttle then it might be good to hike up one trail and down the other (but perhaps not on a Saturday or a holiday, due to limited parking). People in Utah Valley are used to seeing Mount Timpanogos as a monolithic wall, but the other side of the mountain, where the main trails are, is delightfully three dimensional. The Aspen Grove (Mount Timpanogos) trail is a bit more scenic but also a bit steeper and more difficult. The Timpooneke trail has a little less elevation gain and may be in better condition, but is a tad longer. Both trails join up in Timpanogos Basin, and the summit trail then crosses a saddle and continues along the western edge of the mountain ridge on up to the summit hut. These trails are each about seven miles long, giving you a round trip to the summit of fourteen plus miles. Some people think the trails are longer; different people’s measurements have yielded results ranging from under six miles to almost ten miles one way. Either trail will take several hours to all day long to complete, perhaps seven to twelve hours round trip for most people. At an elevation of about 11,750 feet (3581 meters), give or take a foot or two or three depending on which source you consult, the summit is almost a mile and a half higher than the valley floor, and it has different weather than the valley. You will be covering almost a mile of that elevation gain on foot. This is the second highest mountain in the Wasatch range, behind Mount Nebo. If you are physically, mentally, and materially prepared, it is a magnificent hike. Here are some interesting science facts. The higher you climb, the less gravity there is pulling on you, so that may be encouraging. At the Timpanogos summit you’ll weigh less than you did in the valley, albeit just a tiny fraction of 1% less. You’ll be back at normal weight when you return. A difference you’ll be more likely to notice is that at the summit the air pressure is lower, so even though the air has the same percentage composition of oxygen as air in the valley, the air at the summit is thinner so there is less oxygen available to you: about 78% of the oxygen that’s available at valley floor air pressure, and only about 66% of what you’d be used to if you came from sea level air pressure. That can sometimes lead to interesting medical problems if you spend enough time at altitude. Also, if you want to cook something you’ll find that just as water boils at a lower temperature at the valley floor than at sea level (about 204° F instead of 212° F), at the summit it boils at an even lower temperature: about 191° F.
From the Provo Canyon side, after turning up the Alpine Loop and traveling for about five miles while passing Sundance and Aspen Grove, you will reach a U.S. Forest Service fee station, and just beyond that is the Theater in the Pines area, and the trailhead for the Aspen Grove trail (also called the Mount Timpanogos trail). There is also a campground nearby. This trailhead’s parking lot can fill up quickly on Saturdays and holidays during the summer, with hundreds of people heading for the summit, and as many setting out for Stewart Falls (Stewart Cascades). Do not try to get away with parking on the roadway in the no parking areas, or at the BYU Aspen Grove Family Camp, as you may be ticketed or towed. Pay your fee and get to the trailhead early in the morning, by dawn on Saturdays and holidays, which is also important so you can start your hike before the lower trail becomes hot, and so you can finish before dark. Trailhead parking is a problem, and the Forest Service is happy to take your money knowing you won’t have a place to park. There is no cost to use the public road only for travel, provided one does not park (actually there is some debate over whether it is legal for the Forest Service to charge a fee for parking, especially along a road, if one is not using non-trail facilities, see 16 USC 6802, but despite a 2018 handout in which the Forest Service admitted passes aren’t required everywhere, signage is still up that claims paying a fee to get a recreation pass is required for stopping along the loop). Perhaps you could decline to pay at the fee station, and then do the self-service payment in the parking lot if you find a space. If you drive across the top of the Alpine Loop, don’t assume the “Summit” trailhead has a trail to the summit; that’s the “summit” of the loop road, and there are nice trails there, but there isn’t any official mountain summit trail leaving from that trailhead. From the parking lot just past the fee station, the Aspen Grove (Mount Timpanogos) trail is toward the right side of the parking lot as you look uphill; the trail near the pit toilets is to Stewart Falls (Stewart Cascades). In 2016 the Forest Service did put in some small signs to point this out (after putting up a large sign on the importance of paying your fee). If you don’t see the TERT trailhead shack just after crossing the meadow and getting into the trees, you’re on the wrong trail. 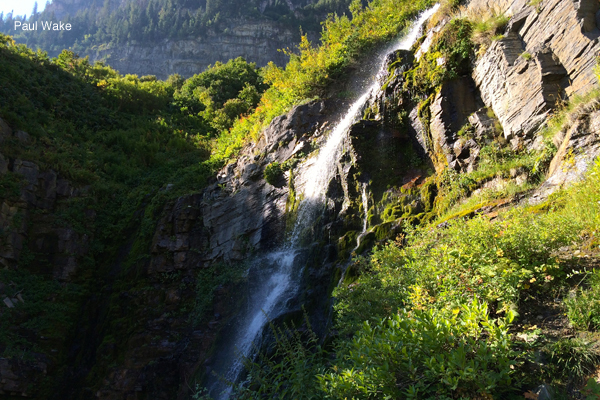 The Aspen Grove (Mount Timpanogos) trail heads westward up the drainage to First Falls, which is also called Timpanogos Falls, and the trail was once paved as far as Second Falls, but that mile and a quarter of pavement is being left to deteriorate. That section of trail makes for a short day hike by itself, as an alternative to the Stewart Falls (Stewart Cascades) trail. Before you get to First Falls, Lame Horse trail will veer away to the right; mind the sign, and take the summit trail to the left. The trail switchbacks up the north side of the drainage from First Falls to above Second Falls, on up to one very long switchback sometimes called the Heber switchback, before traversing a talus slope (a rockslide) below the Primrose Cirque headwall and then switchbacking way up a steep section of the southwest part of the cirque and finally flattening out a bit in the Hidden Lakes area. The switchbacks above First Falls have many spots where the trail veers out just a bit from what would seem like a straight path, and dips down and then up; these are spots where the trail did go straight at a constant grade, but the Forest Service did not repair slumping trail and now erosion is changing the very course of the trail. The switchbacks in upper Primrose Cirque have a number of false trails that can be confusing. If after crossing the big talus slope you soon come to a waterfall, you have missed the first group of switchbacks. Be careful up high on the third group of switchbacks, because if you miss one particular switchback you will quickly be on dangerous ground, and even on the proper trail there is a short bit of rounded over rock that makes for hazardous footing. From Hidden Lakes the trail winds upward toward Emerald Lake, which is at the top of a short but steep hill; the trail has been beaten into that hill straight upward so that it no longer switchbacks to the north as it once did. This five plus miles is enough of a hike for some people, and the area around the Timpanogos Shelter at Emerald Lake is a popular resting spot where hikers contemplate the distance to the summit rising high overhead. The shelter itself may also provide some refuge from storms, but don’t assume it’s a comfortable refuge—it gets cold in there. If you are backpacking, please don’t camp on the “island” in Emerald Lake, or anywhere next to water, unless you want a visit from the backcountry ranger. 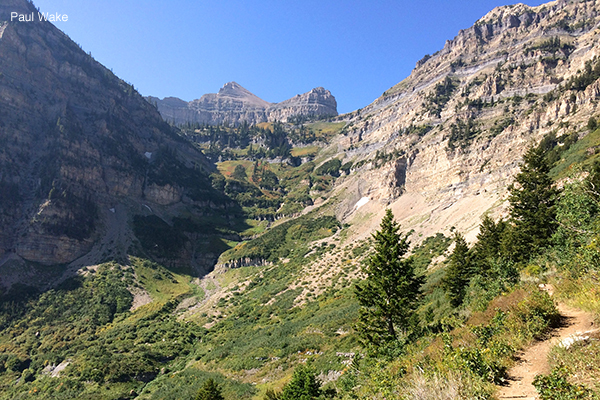 For those continuing to the summit, the trail veers to the northwest and crosses a low ridge into Timpanogos Basin. From there almost everyone heads directly toward the saddle—the col—on the ridge to the west by cutting across the north facing slope on a beat in trail that is more or less passable, although there is a section with rocks that are are unstable underfoot, snow lingers late into the summer above a cliff band, and the last push up toward the saddle is steep with little traction on the dirt. 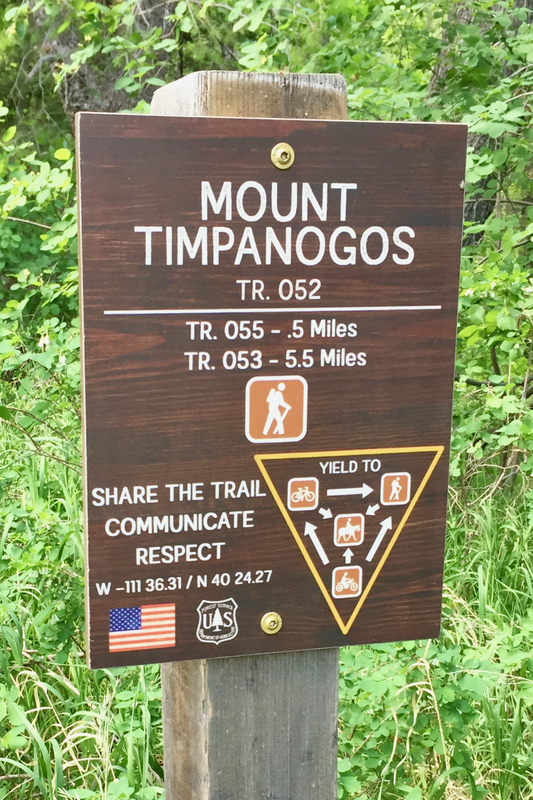 It is also possible to drop into Timpanogos Basin and hike the trail through the flowers to the other side to join the Timpooneke trail and climb to the saddle from there, but that adds a mile and a half. The saddle is another popular resting spot as hikers both enjoy the view of Utah Valley, and ponder a final section of trail that is less than a mile long but seems a lot like the stairs of Cirith Ungol. From the saddle the trail works southward up the west upper edge of the ridge to the summit. There is a summit hut there, although it does not offer much shelter, and below some ledges there is a very long drop down the east side of the summit, that is best avoided. Instead of returning to the saddle and Timpanogos Basin, some people work their way further south and then glissade northward down the glacier from the glacier saddle to Emerald Lake, but that is not particularly safe. Note that although in some years there is enough snow there to hold ski races, in some other years the above ground glacier is mostly gone. One year in the nineties a crevasse temporarily opened in the rock, down through buried ice. From the American Fork Canyon side, traveling up the Alpine Loop after paying at the U.S. Forest Service fee station near the mouth of the canyon, and a ways after passing both the Timpanogos Cave National Monument and the turnoff to Tibble Fork (North Fork), the Timpooneke trailhead is by a parking lot in the Timpooneke campground, which is up a little side road that takes off about eight miles past the fee station. This parking lot too can quickly fill up on busy Saturdays and holidays, so the same cautions mentioned above in the Aspen Grove (Mount Timpanogos) section apply to parking at the Timpooneke trailhead. 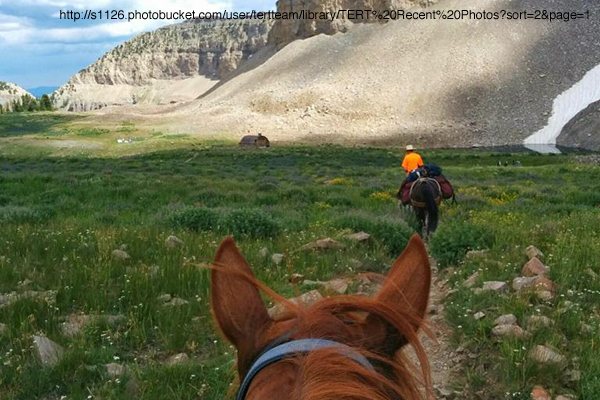 This trail gets some equestrian use, so give people room if they’re unloading horses from a trailer; while hiking, don’t run up on a horse from behind, and if a horse approaches on the trail you should step off the trail—ideally to the downhill side—and quietly talk to the rider so the horse will know you’re there and are human. You can pronounce Timpooneke any way you like. Many people say it something like Timp-a-nookie, but that doesn’t seem like how it’s spelled, as some people will tell you either politely or with some exasperation. There is more than one trail leaving this trailhead, so look for the TERT shack. From there the Timpooneke trail heads southward through evergreens up the drainage. A little over a mile up the trail where the trail turns west there is a short spur trail going east to the Scout Falls viewpoint, which is not always signed. Some people hike just that far as a day hike. The trail then winds through a number of flatter almost meadowlike areas each a giant step above the other, climbs up the west side of the drainage, rising further up the Giant Staircase as it crosses a talus slope, then switchbacks higher yet, crossing a wall toward the rocky upper east side of the drainage, and then climbs up into Timpanogos Basin at a bit under five miles. In Timpanogos Basin, a short way past the old toilet trail, the Timpooneke trail will split, with the left trail going to Emerald Lake and the right trail climbing to a junction with the Aspen Grove (Mount Timpanogos) shortcut trail from Emerald Lake, just below the saddle. Unless you’re out of water and need to head to Emerald Lake with your pump or chemicals, or you want to take a walk into the basin to see the flowers, take the right trail, up the west side of the basin, and be careful because there are spots with a steep drop off where the trail has eroded away due to inadequate maintenance. If you do detour to Emerald Lake and then take the direct route from there to the saddle, you’ll add about three quarters of a mile to your hike. After crossing the saddle the trail heads southward for the final climb to the summit. 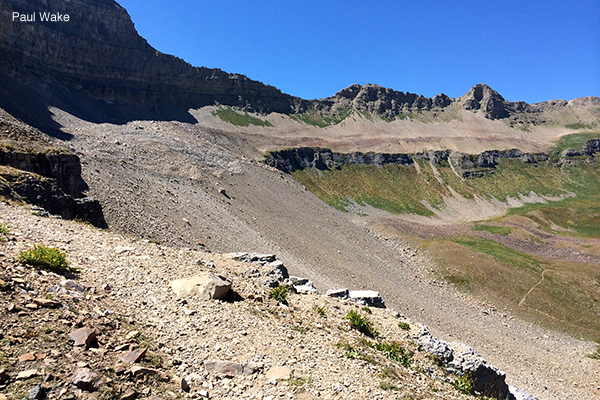 A few people turn off at the old toilet trail when they reach the beginning of Timpanogos Basin, and from a smaller basin to the west work up the ledges to the northwest to find the wreckage of a B-25 bomber that crashed there; that requires off trail route finding on difficult, isolated terrain. What’s left is at N 40° 24.4336′ W 111° 39.3225′ (the lower site) and N 40° 24.4062′ W 111° 39.4034′ (the bottom of the upper site, with flattened wreckage spread further up the slope above). Remember that there is more to do on the mountain than just climbing to the summit. For example, you can hike to Stewart Falls (Stewart Cascades), take a tour of Timpanogos Cave, walk the boardwalk trails at Cascade Springs, explore a lesser known peak or trail on the massif, study the ruins of Utah War defensive structures or other historical sites or attend a cultural event, go camping or backpacking or horsepacking, get a nature guidebook and learn firsthand about the geology and biology of the area, do a service project, play on or picnic by one of the rivers that borders Timp, drive the Alpine Loop during the fall, or enjoy winter activities such as downhill skiing at Sundance or going cross-country skiing or snowshoeing. Just treat the mountain well. Whatever your activity, be careful driving home. It’s dangerous once you’re out of the woods. 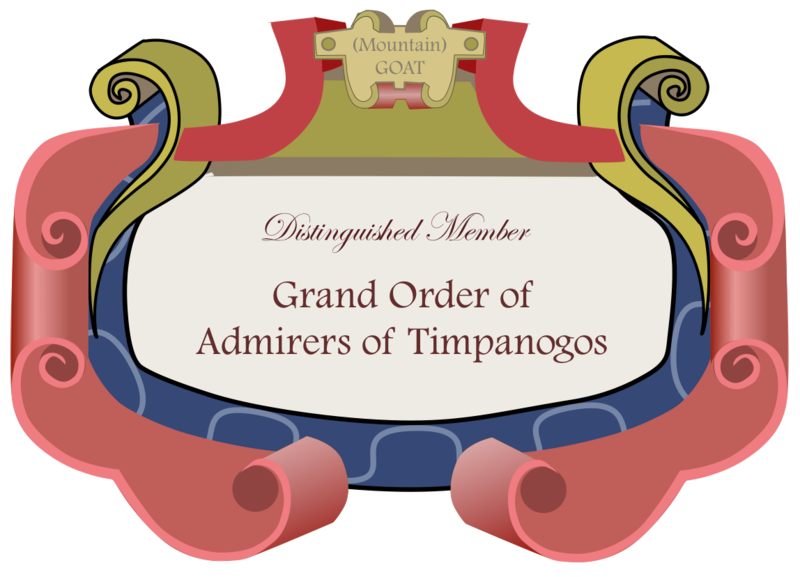 If you do any ten of the above twelve activities, you can join the ranks of the Grand Order of Admirers of Timpanogos. It might not be quite the same as joining the illustrious pantheon of Timp hiking worthies: Stewart, Roberts, Hart, Pace, Kelsey, Hilton, Heaton, Kearney, Meyer, Ashcraft, Woolsey, Lowry, and others. However, by self-awarding yourself membership in the Order, you can do exciting things like printing the graphic on the right onto sticker paper, and pasting it on your forehead or Timp map or anything else that strikes your fancy. Not many people do that! In doing any of these things, remember the importance of prudence. Apart from the summit trails, Stewart Falls (Stewart Cascades) is one of two places in the county—the other being Bridal Veil Falls—that are hot spots for injury due to the large number of people going there unprepared while assuming they will have easy and safe walks, which results in lots of relatively minor injuries, and sometimes in more serious injuries or in deaths from leaving the trail and falling because multitudes are unable to grasp the wisdom of staying off steep, sketchy places. Exploring remote or steep areas involves an increased risk of being removed from the gene pool if it turns out you shouldn’t have gone there. When engaging in wholesome recreational activities near the rivers be mindful of the drowning danger, especially during spring runoff, and of the need for wearing PFDs when floating Provo River. Don’t drive the Alpine Loop with a trailer or an RV, as it’s a narrow and twisty road in the middle part. Winter backcountry travel entails serious avalanche danger, which demands competent avalanche terrain reading ability and well practiced companion rescue skills. If you want to do something really amazing, and you're a strong hiker with ties to a nonprofit or governmental or university group that will back you up and can claim some interest in Timp, try to get Google to let you carry their Trekker along both trails to photograph them. That still hasn't happened. The map on the left below shows how to get to the trailheads. 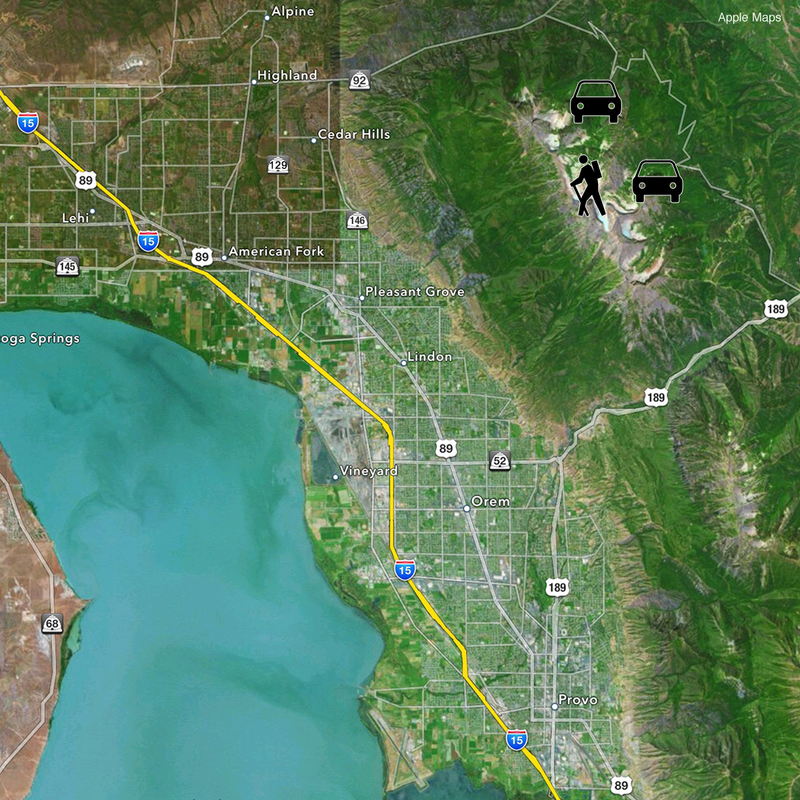 You can approach the Alpine Loop from Highway 189 on the south side, or Highway 92 on the north side of Utah County. 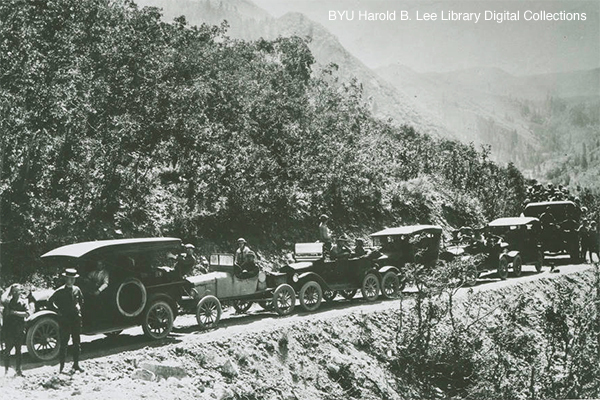 In Provo, Highway 189 is University Avenue, which goes to Provo Canyon; you can also reach Provo Canyon from Highway 52, 800 North, in Orem. From the Thanksgiving Point area, Highway 92 is the Timpanogos Highway through Highland, which goes to American Fork Canyon; you can also reach the mouth of American Fork Canyon by going up North County Boulevard, Highway 129, the bottom of which can be reached from Pleasant Grove Boulevard, to Highway 92, or by following Highway 146, 100 East in Pleasant Grove, which becomes North Canyon Road and travels along the base of the mountain. From the east, take Highway 189 from Heber. In the wintertime the Alpine Loop is closed between Aspen Grove on the Provo Canyon side, and a short way above the Tibble Fork (North Fork) turnoff on the American Fork Canyon side, at Pine Hollow. The satellite image on the right shows how in the early summer there will be little snow showing on the Utah Valley side of the mountain, and the trailheads will be green and warm, with birds singing and creeks burbling. However, the bowls of the upper mountain will still be in the grip of the White Witch. Click either map for a larger view. The topographical map below shows the general route of the summit trails. You can click on it to get a printable version good for portable use. The webmaster has a Timpanogos Emergency Response Team-specific map too, but it is cluttered with labels and probably not as useful as the one below. Sunrise from the summit, in winter. Building the trail with picks and shovels. 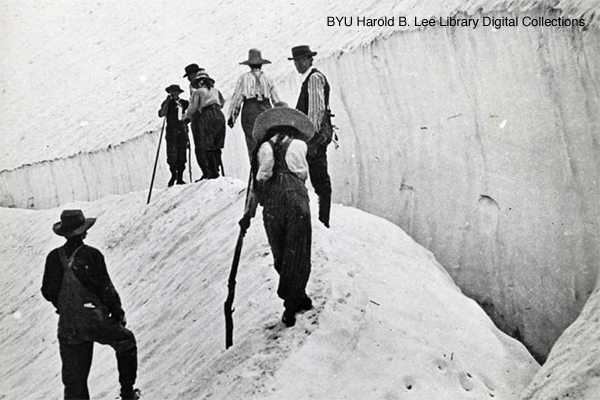 Climbing the glacier in 1907, and exploring a small crevasse. Mr. and Mrs. Roberts on Timp. 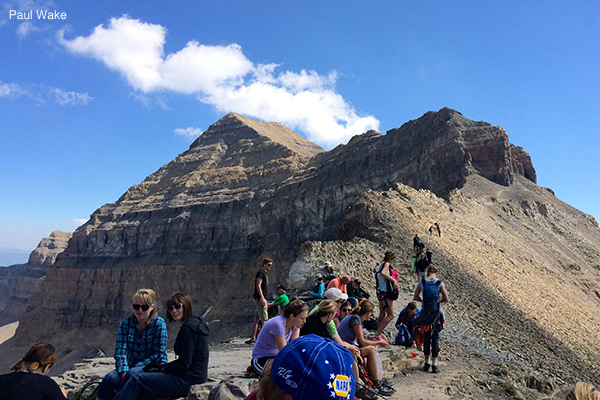 Eugene “Timpanogos” Roberts began the annual Timp Hike. 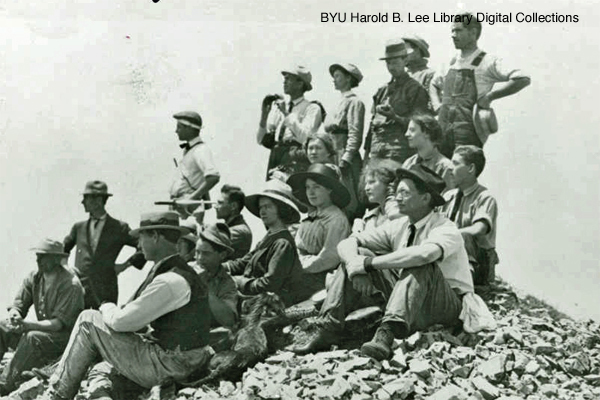 In 1912, almost two dozen mighty conquerors, well dressed for the occasion, enjoyed summiting on the first annual Timp Hike. This began a tradition that lasted for five decades. The first annual Timp Hike required getting up to Stewart’s Flat (now Sundance) and camping, then bushwhacking the next day up to the summit, and going back to the valley on the third day. 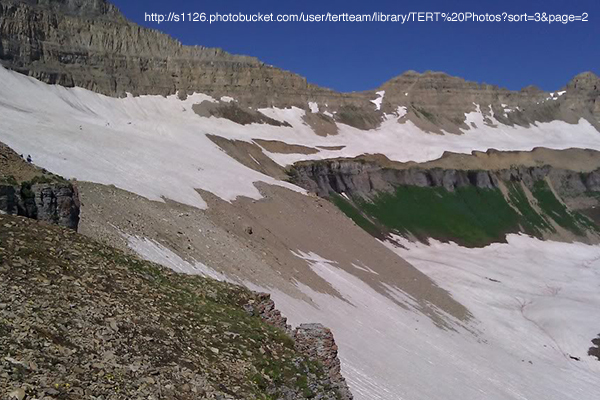 Early Timp Hikes went up the glacier, sometimes with a fixed rope for aid. Some things never change. Lots of traffic on a narrow road. The annual Timp Hike grew to have a prehike bonfire and program. The community came to treasure their mountain playground, built better trails, the Theater in the Pines, and added shelters on the mountain. 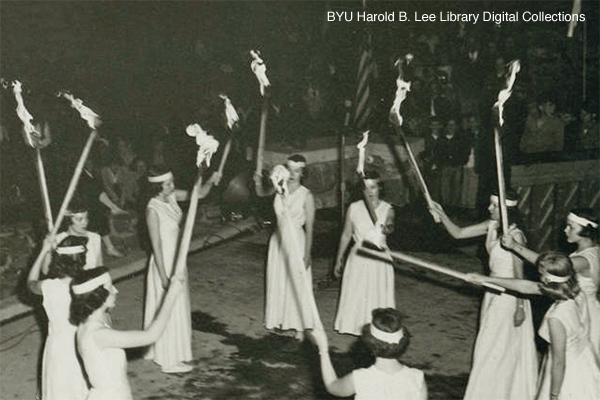 Torch lighting ceremony at a prehike program. Timp Hike festivities included plays, contests, and important advice for hikers such as counsel to not hike in high heels. Planning a Timp Hike. 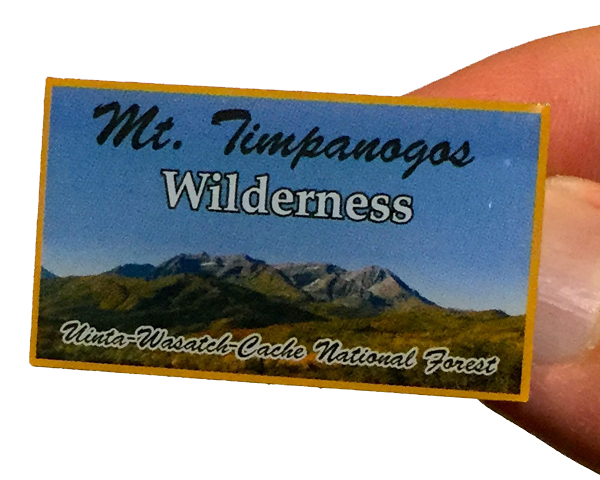 People who summited received round commemorative pins, which changed each year, and some participants were awarded Timp Sticks. The meadow at the Aspen Grove (Mount Timpanogos) trailhead. The trail starts to the right. The trail on the left side of the meadow, by the pit toilets, is to Stewart Falls (Stewart Cascades), a family day hike (mind the stinging nettle). In this springtime photo there is too much snow on the upper mountain to safely hike to the summit. In the wintertime, avalanches have buried a number of people in this valley. Timpanogos Emergency Response Team shack about a hundred yards up from the Aspen Grove (Mount Timpanogos) trailhead. Sign the register, and chat about trail conditions and summit weather. If you’re starting as early as you’ll need to if you want to find parking on a Saturday or a holiday, the volunteer might not be up yet, though. 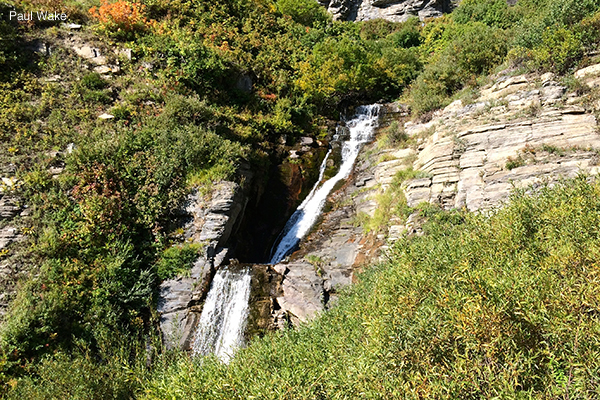 First Falls, also called Timpanogos Falls, is about a mile up the Aspen Grove (Mount Timpanogos) trail. In past decades, most of the falls and ledges had now largely forgotten names. Second Falls is about a quarter of a mile past First Falls, and it is where what’s left of the old pavement ends. This is also where Lower Killer Snow Hole forms in the spring and early summer. Sometimes the sheriff blasts the snow in the spring to save lives, but always presume that snow near waterfalls is particularly dangerous. After traversing the rocky slope visible in the center right of the photo, the trail switchbacks up to the top of Primrose Cirque through the green area to the center left. In the spring, Upper Killer Snow Hole forms at a spot most of the way up the switchbacks. Wait until mid summer to hike here, and then please stay on the trail, instead of making worse the erosion producing shortcuts across switchbacks. Hidden Lakes is a popular camping area for backpackers. It was especially popular when there were toilets here, but the Forest Service no longer maintains toilets in the wilderness area. The trail is by the crescent of trees on the left of this photo, which was taken from above. 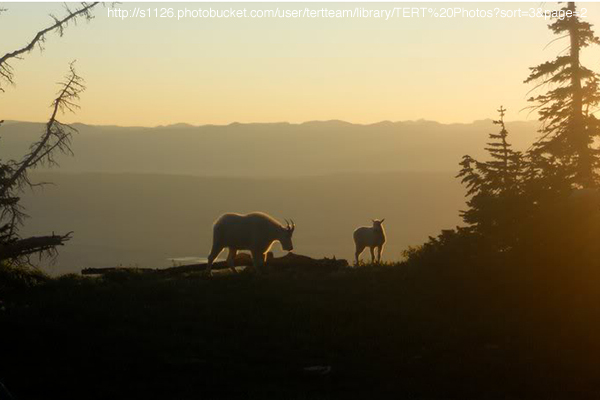 From Hidden Lakes on up, mountain goats are a common sight on Timp. Unless someone’s unleashed dog has chased them off. Emerald Lake, at the foot of the glacier, is a reliable source for filtering water. If you’re backpacking, please pitch your tent away from the water. Sliding down the glacier—which is mostly gone in this photo—is an optional route down from the summit, but one that frequently causes injuries. This is the Timpanogos Shelter at Emerald Lake, a historic structure in need of maintenance, and an important refuge on the upper mountain. The white summit hut is barely visible far above, with a cloud behind it. 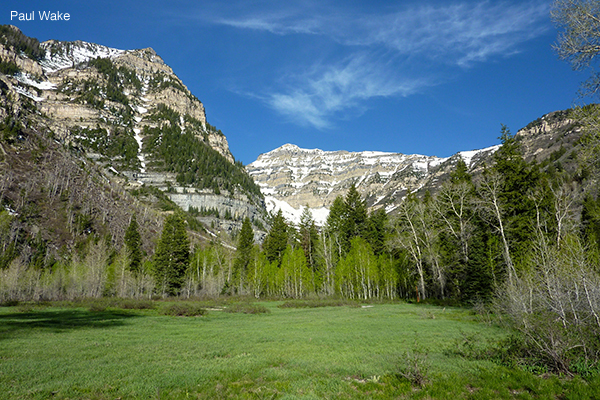 The saddle is the dip in the western ridge of Timpanogos Basin by where the Aspen Grove (Mount Timpanogos) and the Timpooneke trails combine. By this point, people are often feeling the altitude. Here is an example of why hiking before the snow has melted is risky. 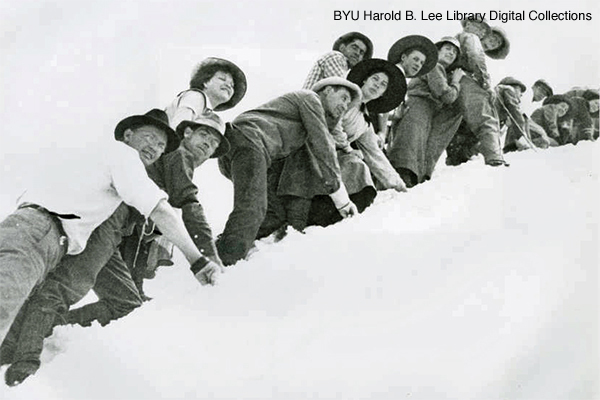 These people, hiking toward the saddle, are crossing a slippery snow field above a cliff band. There is a large, flat area at the saddle that makes for a popular resting place and viewpoint. All these good people are packing out their own litter. Mountain fuel. 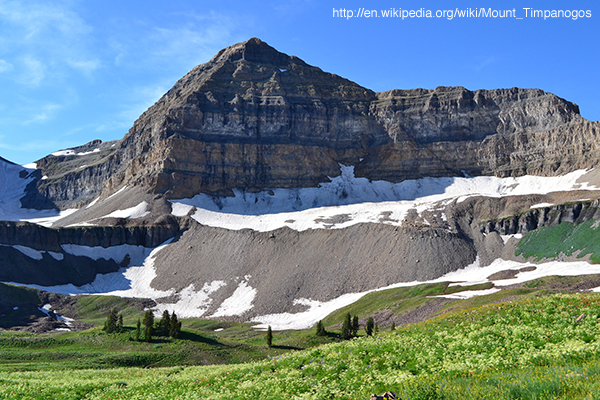 Always have liters of water, food, good footwear, and warm clothing when hiking Timp. Sun protection, a first aid kit, illumination, and a map are important also. TERT shack near the Timpooneke trailhead. More than one trail leaves from the same trailhead. 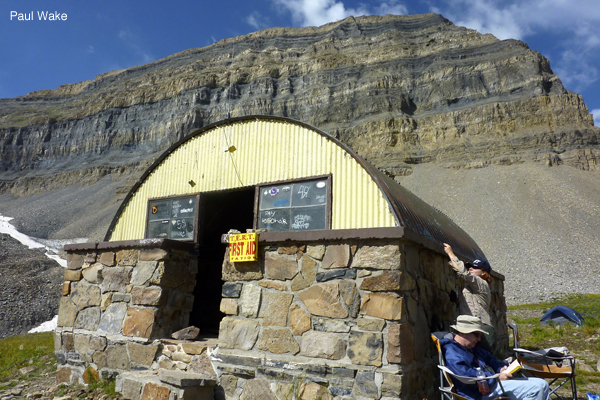 For the Timp summit, take the trail that goes by this shack. Looking up the Timpooneke Trail; the trailhead parking lot is in the bottom center. 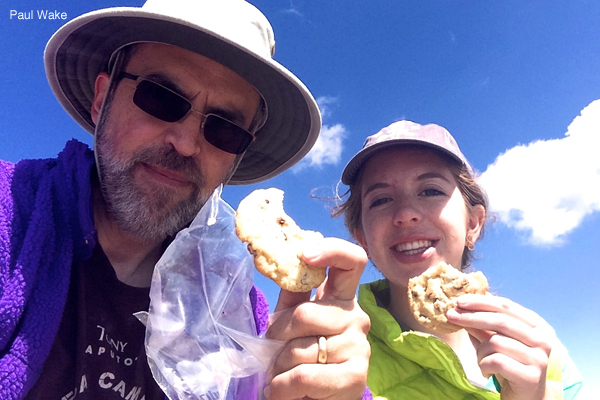 This is an early summer TERT flight surveying mountain conditions. The top of Timp, as seen from the Timpooneke trail in Timpanogos Basin. One reason the wilderness meadows are so beautiful is the absence of fire pits. 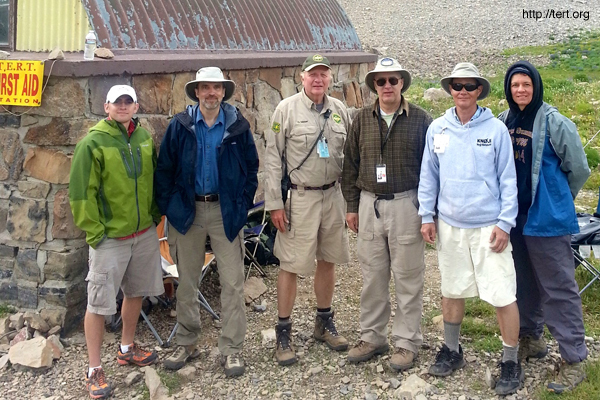 A typical TERT high camp team, at the Timpanogos Shelter near Emerald Lake on a Saturday: a team leader and assistant leader, an amateur radio operator, and medical personnel, all volunteers. TERT getting familiar with Life Flight hoist capabilities, during training at Aspen Grove. If you mess up badly enough to need a lifesaving flight to the hospital, it will be the most expensive six minutes of your life. 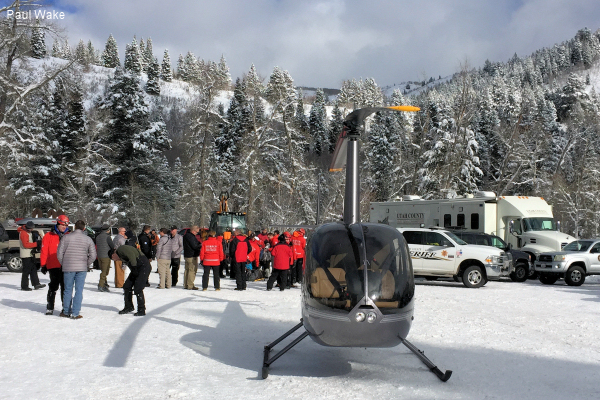 The Utah County Sheriff’s Mounted Posse helps get supplies positioned for TERT, and helps Utah County Sheriff Search and Rescue with searches and evacuations. SAR training at Aspen Grove. SAR does have a bad habit of clogging trailheads and keeping them clogged. On the upside, they provide a lot of service for free. 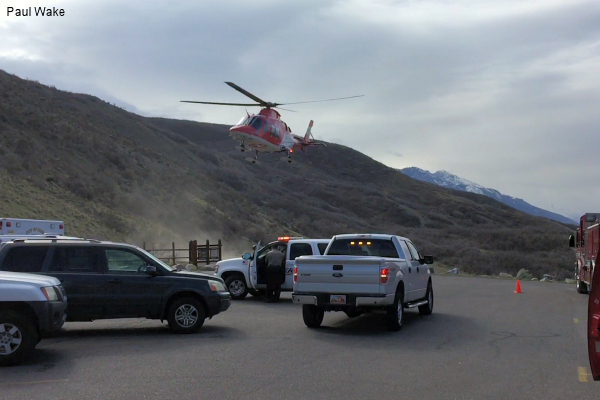 SAR staging at the Dry Canyon trailhead above Lindon in the spring, to rescue an avalanche victim. Note that helicopters only enter the wilderness area when someone’s life is in danger. North Fork Fire, and SAR, getting a wheeled litter ready for another trip. What could be better than a ride over rough terrain in a rigid litter balanced on one wheel, while injured? Timp in autumn, at Aspen Grove. The peak in the center left is Roberts Horn. You would think the U.S. Forest Service would have put a decent amount of information online about the summit trails, but it hasn’t. 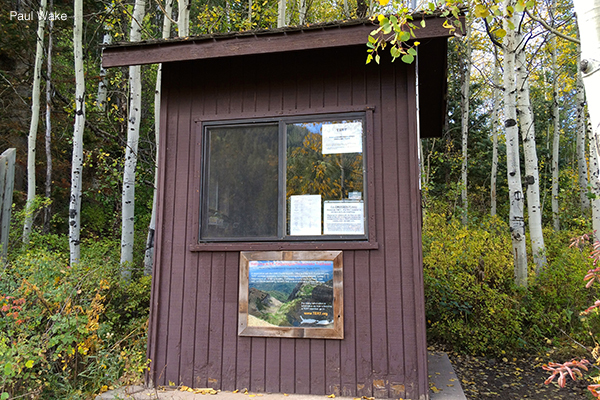 It has not even done a very good job with trailhead information, a largely pointless sign it put up in 2018 being a prime example (photo at left), and when you hike past the plaque on a rock near the Aspen Grove trailhead you may notice that much of the information on that plaque is inaccurate. It’s no secret that they would rather limit use than facilitate it. They even keep talking about a possible permit system. Timp is a cultural treasure that should not be subjected to a permit system. Avoiding such an abomination is in part a responsibility of hikers, who need to stop littering and stop shortcutting across switchbacks, which only encourages the feds to try to lock up our mountain. If you happen to meet any officials from the Pleasant Grove Ranger District of the Uinta-Wasatch-Cache National Forest, please tell them that the Forest Service should do more than token maintenance and should rebuild the missing parts of the trails (it’s not as if they don’t have entrance fees flooding in that should be used for that), and also should maintain the historic Timpanogos Shelter at Emerald Lake. 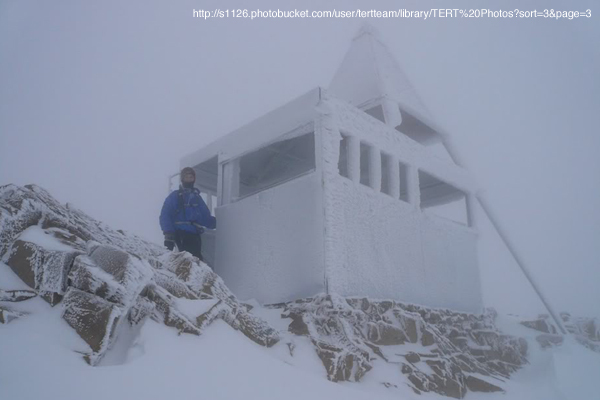 Washington’s Green Mountain Lookout in the Glacier Peaks Wilderness was preserved; our Timpanogos Shelter should be also. Preserving requires a lot more than piling up rocks against the side that is falling down. Sadly, but utterly predictably, despite having promised to begin restoration in 2016, the Forest Service did nothing. 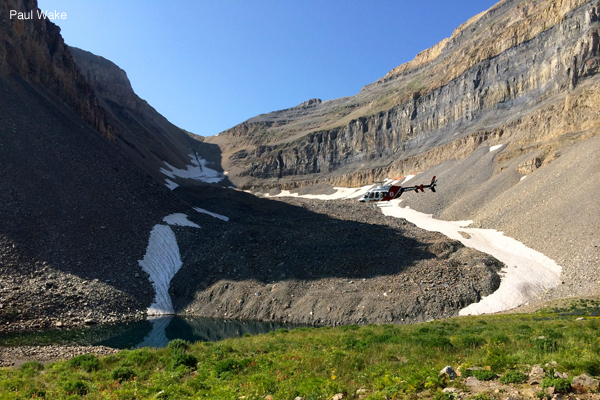 The Timpanogos Emergency Response Team sometimes provides weather and trail condition updates directly from the mountain. Michael Kelsey wrote the definitive book about Mt. Timp, but it is out of print. You should be able to borrow a copy through your library, using interlibrary loan if necessary. There are also used copies for sale online. As with all of Mr. Kelsey’s guidebooks, the route maps and descriptions are approximate and assume you are able to do route finding on your own with only general pointers as to where to go, and his estimates of trip length and difficulty are quite optimistic for most hikers. There is a lot of interesting historical information in the book, in addition to suggestions for many lesser known hiking routes. The other two books listed here are an interesting history by Jared Farmer (“Here is the creation story of a landmark—one beloved peak in the American West. In the beginning, this mount had form without meaning. It was not visible, nor haunted; now it is both. Getting to the bottom of the matter requires disorientation. The bedrock is liquid. The landmark’s life history beings with the ghost of a lake.”), and a coffee table book of Willie Holdman photography. 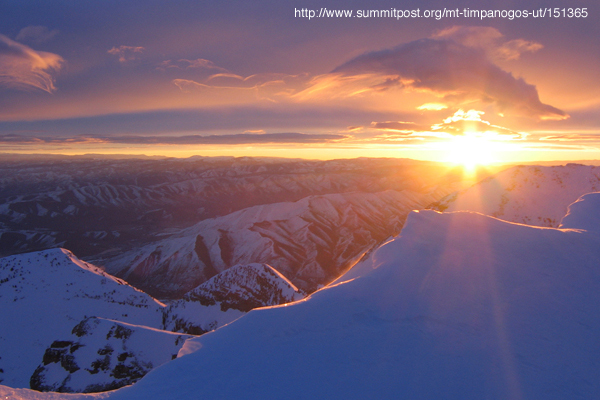 Summitpost.org has a lot of online information on climbing Timp. Some other online hiking guides. If you’re going up the mountain in the winter, know the snow. The history and geology of Mt. Timpanogos is fascinating. Regarding history, Timpanogos Basin used to be called Big Hole, Hidden Lakes used to be called Spring Lakes, Primrose Cirque used to be called Little Provo Hole, and Big Provo Cirque used to be called Big Provo Hole, and all of the waterfalls on the Aspen Grove side were named. 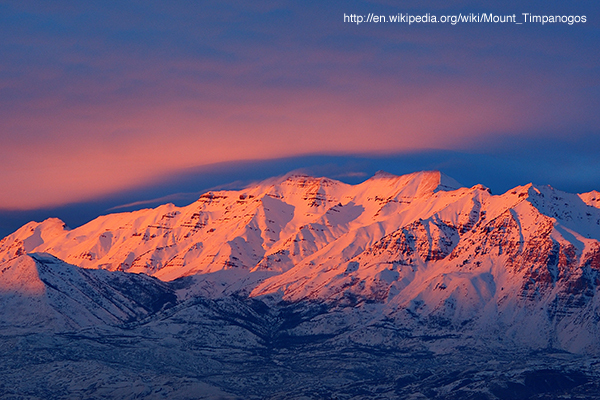 Wikipedia has an entry on Mount Timpanogos. Already Know Why Mosquito Bites Itch, But Want to See What Else You Know? Want to Try Another Test? Landing Zone Tips (bottom of page under “Aviation”; this is an archived version of the web page); for more information on Utah medical helicopters, here is an interesting story. Want to Learn to Be a Rescue Hero? Want More Options? And More? And Even More? 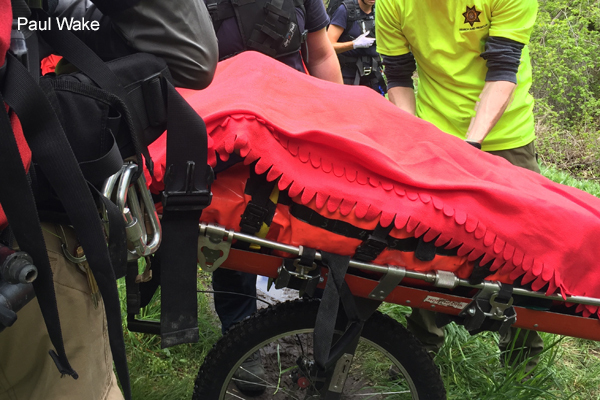 (these courses will give you a pretty card that you can show to injuries if you think it will heal them, but only experience will take you from giving bumbling care to providing helpful care—this means you, WFRs and paper EMTs: primum non nocere! ); want a more critical view? Will You Go to Hell If You Litter and Cut Across Switchbacks? 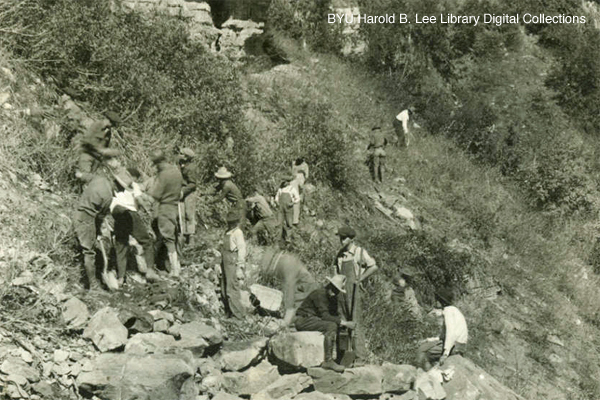 In 1937, a fifty three year old Ohio man on the annual Timp Hike died of a heart attack near the top of the glacier, despite efforts by Boy Scouts and doctors to resuscitate him. In 1943, three local men aged twenty five, thirty one, and thirty two died when they were caught in a snowstorm while deer hunting up on the mountain near the north end of Roberts Ridge; a fourth man was brought down alive. In 1946, a thirty nine year old man who had gone to the Stewart’s Flat area alone to teach himself to ski was found dead of a heart attack. 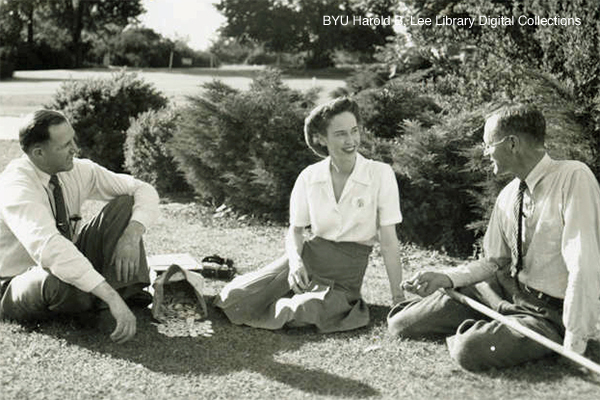 In 1954, a nineteen year old woman from Provo died on the annual Timp Hike when she was struck on the head by rockfall from the cliff above where she was descending the glacier. In 1955, five men died—a twenty two year old Air Force engineer, a twenty five year old Air Force co-pilot, a thirty year old civilian employee of the Air Force, a thirty three year old pilot, and a forty five year old civilian employee of the Air Force—when their B-25 Mitchell medium bomber crashed into the side of the mountain above Timpanogos Basin while flying in bad weather from Montana to California. In 1961, a forty five year old man died when a Cessna 172 from California, in which he was a passenger, crashed into trees on the mountain near the top of the Alpine Loop; the pilot, who had dropped through clouds and unexpectedly discovered he was quite close to the mountain, survived his many injuries despite being trapped in the wreckage for days in winter weather. In 1964, a nine year old Orem boy on the annual Timp Hike died after falling from the east side of the summit onto ledges below (he did not fall all the way down the cliff face), either because wind gusts blew him over as he was close to the edge, or because a dog nudged him; despite a rescue effort by people on the mountain who downclimbed through continuous rockfall caused by spectators, and by a helicopter pilot flying up through difficult winds, the boy’s injuries proved too severe to survive. In 1966, a thirteen year old girl and a forty nine year old woman from Provo died when they fell from a malfunctioning ski lift at the Timp Haven Resort. In 1969 or thereabouts, a hiker who decades later told this webmaster about it saw resuscitation being attempted on a man whose body was laying on Couch Rock/Cardiac Rock. In 1969, a sixteen year old boy from Murray adventuring on his own in the East Peak/Elk Point area, fell and died; his body was located a week later. In 1972, a sixteen year old girl and a seventeen year old girl, both from Utah County, were raped and murdered at the Aspen Grove trailhead by someone who had recently been released from a mental hospital. In 1975, a twenty six year old Provo man died when, while walking the Timpanogos Cave trail, he decided to try to climb a nearby cliff without gear, and fell. In 1980, on June 8, a twenty six year old man from Oregon died when he fell into what is sometimes called “Lower Killer Snow Hole,” by First Falls above Aspen Grove, a part of a snowfield with snow melt running beneath it that thins the snowfield from the bottom up, essentially making an ever thinning snow bridge that hikers mistakenly assume is solid all the way the the ground. In 1980, on June 9, a twenty six year old man from Orem died when he apparently descended down the same snowfield as the June 8 victim, and fell into the same killer snow hole; searchers found the body of the Oregon man when looking for the Orem man. In 1980, a twenty four year old Brazilian died from a fall in Primrose Cirque while hiking Timp in late October; his companions could not locate him because of darkness. 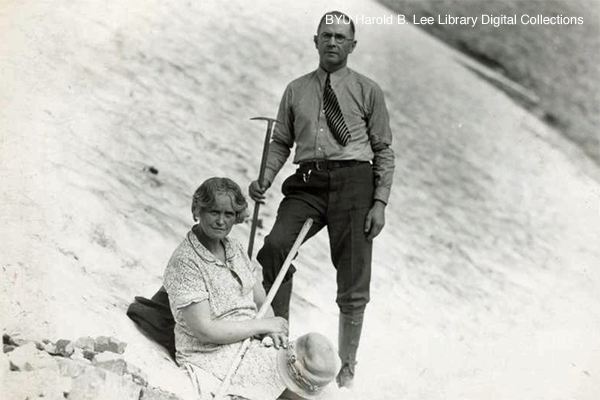 In 1982, a twenty nine year old man from Nephi died at Lower Killer Snow Hole when he fell through the snow, dropping into the rocks and rushing water of a snow cavern. In 1982, a fourteen year old Orem boy died on July 3 when he fell into what is sometimes called “Upper Killer Snow Hole,” near the waterfall by the upper Primrose Cirque switchbacks, landing in a deep crevice that it was difficult to rappel into to retrieve the body. In 1985, a seventeen year old girl died when she slipped and fell down a steep snowfield and over a ledge while hiking with classmates from the Unified Studies group from Orem High School, which was making its way through the Big Provo Cirque area above Sundance when this and another accident happened. In 1988, a local thirteen year old Boy Scout from Orem died when he fell at Stewart Falls (Stewart Cascades) while climbing along a rock wall after he and a friend left camp to go hiking. In 1990, a twenty two year old BYU student from Centerville died after falling from a cliff near Stewart Falls (Stewart Cascades), where he had gone to pray about marrying a girl. In 1993, a fifty year old skier from Florida, who was part of a group skiing in a closed area of Sundance, died when he was buried in an avalanche. In 1994, a twenty four year old Lehi man committed suicide above Stewart Falls (Stewart Cascades). In 1997, a twenty six year old USU student from Logan died while skiing a snowfield on the Timpooneke trail, when he fell and then slid into a crevasse. In 1997, a forty one year old Provo man was found dead in Timpanogos Basin, having gone there to meditate and find himself, but ultimately having died of hypothermia. In 2003, an eighteen year old, a nineteen year old, and a twenty year old from Utah County who were snowboarding north of Elk Point, died when a series of avalanches from high above came down the northeast chute and buried six of nine people in the area (a family of four nearby was knocked down by the avalanche’s air blast but was not caught in the snow, and they dug out one victim who was partially buried twice); none of the men were wearing avalanche beacons, the Utah Avalanche Center had issued a rare “extreme danger” warning that afternoon and searchers were limited in the amount of time they could spend in the area (not that it would have mattered at that point), and only one of the bodies was found within days, with the third body not located until the spring, by a rather surprised hiker. 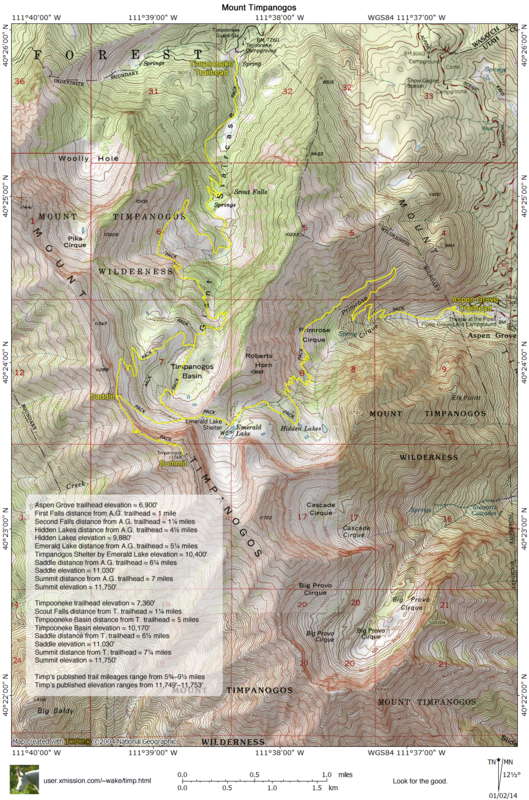 In 2005, a thirty one year old snowshoer with a wife and two daughters in Salt Lake County, died in a slab avalanche above Hidden Lakes; neither he nor a friend who was with him had avalanche beacons, and conditions hindered searchers from reaching the site (not that it would have mattered at that point), and his body was not located until the summer. In 2006, a forty one year old man from Russia died when he tried to rescue a three year old girl who was distracted by a can of chips and walked off the edge of the Timpanogos Cave trail; she slid to a stop just short of a precipice, but when he tried to reach her he slipped on the shale slope and slid over the edge (two other men eventually reached her and stayed with her until they could be rescued). In 2007, an eleven year old Pleasant Grove boy was killed by a black bear that drug him from the tent his family was camping in off Timpooneke Road past the campground; there was food in the tent, and the party that camped there the previous night had left food out. In 2010, a fifty eight year old Timpanogos Cave National Monument employee died while doing maintenance on the paved trail to the cave, when he accidentally drove a motorized trail bike off the side of the trail and fell hundreds of feet. In 2012, a twenty two year old BYU student from Nevada died when he fell while climbing rock, without gear, at Stewart Falls (Stewart Cascades) while on a church outing. In 2018, a thirty six year old man from Orem adventuring on his own in the East Peak/Elk Point area, fell and died; no one knew he had gone to that area, although after he was reported missing and his car was found at Aspen Grove, his body was eventually found a few weeks after he fell. Most commonly, about three years pass between fatalities. The last one was in 2018. Last updated on Utah’s statehood day in 2019.